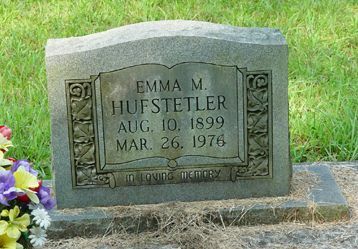 Emma Husley, daughter of William and Callie Hulsey, wife of Jess Hufstetler. There is some confusion over the last name for this family. Sometimes they are listed as Hufstetler, sometimes they are listed as Hite. She may have married a Jesse Hite, then married a Jesse Hufstetler. Mrs. Emma Hufstetler, of Route 2, Cartersville, died Friday. Funeral was at 2 p.m. Sunday at Center Baptist Church with the Rev. Roland Lee in charge. Interment was in Old Macedonia Cemetery. Survivors are her husband, Jess Hufstetler; two sons, Jesse and Guy Hufstetler, both of Cartersville; 10 grandchildren; three great-grandchildren; a sister, Mrs. Daisy Webster, Marietta; several nieces and nephews.